Vinyl gutters Houston are made from Polyvinyl Chloride, commonly referred to as PVC. PVC plastic has some outstanding qualities that are not found in other materials, including resistance to corrosion. This feature alone makes vinyl gutters a very good option for wet or rainy areas. PVC does not dent when accidentally hit by hard objects such as a ladder. Vinyl gutters are lightweight compared to other gutter materials. This makes it easy to install vinyl gutters, which drastically cut down installation time on the part of contractors resulting to reduction of overall costs. Because of the ease of its installation, vinyl gutters are preferred by many do-it-yourself (DIY) enthusiasts. However, if you are not certain about your roofing skills, we recommend hiring a professional to do the installation because gutters have to be correctly hung in order for it to function properly. Compared to other gutter materials, vinyl gutters are cheap. A 10-foot section could be bought for $3 to $5, although there are additional expenses for accessories such as couplings, hangers and downspouts. With these added costs, you could be paying $3 to $5 per linear foot. This is still a bargain compared to other materials. PVC plastics are dyed and not painted. 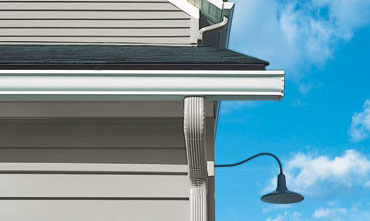 A vinyl gutter will have the same color all throughout its body. If the gutter is scratched or scraped, the damage will not stand out because the exposed area will have the same color as the rest of the gutter. PVC plastics have the tendency to become brittle when regularly exposed to extreme weather conditions. They could crack or split when left outdoors for an extended period of time, particularly when they are exposed to excessive heat and cold. Cheaper versions of vinyl gutters are available in the market, which are thinner and more brittle than the more expensive ones. They are more susceptible to damage and failure with age. The thicker and better the plastic, the less likely it will break down with time. People consider vinyl gutters as having an inexpensive look, and therefore, visually unappealing. If the physical look of gutters is a primary consideration for a homeowner, then vinyl gutters are at a disadvantage because of their non-elegant appeal.